Based on the work of Wally Satzewich and Roxanne Christensen SPIN (Small Plot INtensive) farming using urban lots to grow food. Ensuring that quality, organic food is produces close to market and ever closer to customers. Curtis has been a practicing SPIN farmer now for over two seasons. In his first season a $8,000 investment yielded $20,000 in profit. This year he informed the crowd that he added another $5,000 into the business to top the season at over $65,000 in sales. This year Curtis is continuing to farm through out the winter challenging the common held beliefs that farming in Canadian winters is impossible. On Thursday, Movember (yup, Movemeber) 10th, 2011, over 75 keen urban gardeners, permaculturalists and students of all things regenerative gathered at the Fernwood Community Centre. The topic, SPIN Farming (Small Plot Intensive Farming); the speaker, Curtis Stone. 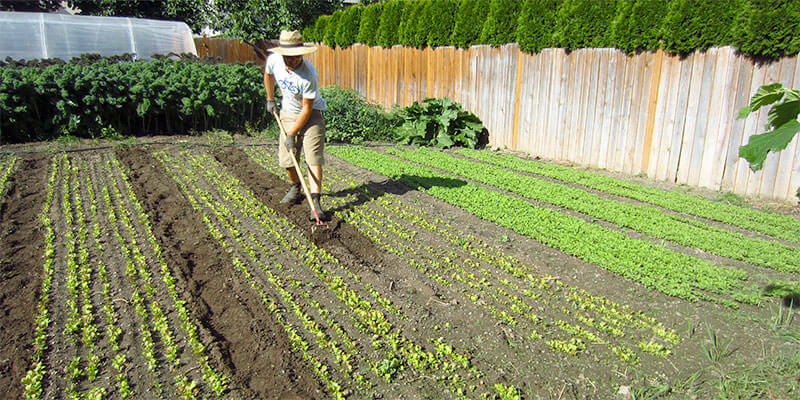 Curtis shared his profitable and productive business model of growing organic vegetables within city limits, on abandoned or under-utilized urban lots in Kelowna, BC. He moves his produce, compost and tools all with human powered transportation – a bike and bike trailer. He shared his growing tips, marketing stratergies & logistical plans with everyone in attendance through a 2-hour multimedia presentation. The questions were plentiful from this knowledgable crowd whom were no strangers to compost & soil under their fingernails; a hard working, mulch-loving crowd. All in all, it was a great evening. In many ways, SPIN Farming is the ying to the yang that is permaculture design. If permaculture food forests are a community’s ‘savings account’, then SPIN farms are the ‘chequing account’. Lots of energy transactions & shorter-term returns on investment. As David Suzuki points out, we don’t know what the solutions of an uncertain future look like. But we do know that we need a diversity of stratregies if we are to adapt. Curtis demonstrated a very successful model for what is an extremely important tool in a regenerative community’s toolbox. The first thing I noticed at Curtis Stone’s Growing Food in the City talk was the crowd. Young, enthusiastic, full of men with beards and women in plaid. I have no doubt that the growth industry (no pun intended) of our generation is local food, and this was a room of entrepreneur ready to dig into the subject matter. Second, I noticed Curtis himself. Young, enthusiastic, and bearded to match the crowd, Curtis is an inspiring mix of exceptional and ordinary — a city kid with no previous gardening experience, who turned a few thousand dollars and enthusiasm into a professional wage while feeding Kelownans high quality organic food in just two years. Third, I noticed that while Curtis’s work is an accomplishment in itself, it’s only the beginning — it will take many more Curtisi (I think that’s the plural of Curtis) before Kelowna is fed internally, and there are many more cities across Canada (nevermind the US, Europe, etc) that don’t even have a Curtis. Seem there should be a campaign put together, “More Curtisi!” And even then, there will be a need for waste handlers, composters, local-food seasonal chefs, value-added food processing and urban livestock. Make no mistake, I don’t mean to minimize what Curtis is doing, but to show how powerful and expansive his work is. One man with a few friends, a few yards, and a bike has become a symbol for the beginning of our re-localized economy. The last thing I noticed, after Curtis Stone finished speaking, was the sense of resolve in the audience. Curtis told us we can do it, and we believed him. Now it’s time to prove him right. Seems more then a few people left inspired and ready for the next task at hand, feeding Victoria from the inside out. If you’re interested in learning more about SPIN Farming check out Curtis’s upcoming SPIN Farming Instensive in April 2012, it’s everything you need to start learning about SPIN Farming and putting down roots to dig up for market. Submitted by colin thomas (not verified) on Sat, 2011-11-26 06:12. I have just discovered the Permaculture BC website and I am excited to see more people involved so close to home (I’m in Castlegar). I hope to read lots of great stories, learn from this website, and perhaps make some connections over the coming years. Keep up the good work and spread the word. However after saying that I feel the need to comment on the SPIN Farming article though. I have been following that movement as well for a few years because I have been wanting to make a living from urban farming. I have had trouble thought with blending my biggest passion permaculture with SPIN farming. They don’t really seem compatible to me. That’s not to say that I don’t like SPIN farming. I do and I have been following Curtis’s story since he started out and I like the idea of such a small investment with a nice return. He has been very successful with it and that is very inspiring to many people. I wish him all the best as do I others that want to follow him and the SPIN model. What bothers me is that this article is on a permaculture website and it has nothing to do with what permaculture is. Sure permaculture wants us to grow food as locally as we can using organic techniques to build strong healthy communities, but in my opinion that is where the similarities end with SPIN farming. With permaculture we have a set of principles that we use to design landscapes. These principles help guide us in making diverse, resilient, stable systems that provide all life forms with its needs for survival. These systems “usually” require low energy input to build and maintain them, cycle nutrients, use appropriate technology, value diversity, use slow and steady solutions, and integrate rather than separate to name but a few of the ideas behind permaculture. SPIN farming seems very one track minded to me with the only thought being how many crops can we create off this plot and how much money will it give us in return. All fertility appears to be trucked in from somewhere else and the soil is tilled all the time knocking back the soil life’s ability to create fertility itself. The plots/crops rely on constant irrigation for survival and there is no interaction of elements. To “me” it is just a mini monoculture farm closer to home. I write this reply because I don’t want people to read this article, see the pictures in it, and think that this is what permaculture is or looks like. “I” think a line at the beginning stating that this is not permaculture but something else great that is being done would have helped readers differentiate the two. This reply is coming from a permaculturist who is trying to find a way to make a living doing urban farming. I am torn between the success of SPIN financially and my passion for permaculture. Have a great weekend and I hope to here back from you.